Whether it's a long-planned trip or a spur-of-the-moment outing, people like to view, listen to, even participate in art when they arrive at a destination. It's all part of the cultural tourism trend. Hotels and resorts in Palm Beach County, Fla., have gone all in recently. The Boca Rotan Resort & Club has started an artists-in-residence program. It's also the home of the Baker Sponder Gallery, surrounding visitors with sculptures and other contemporary artworks. The gallery features internationally known, museum-represented artists. You'll find another gallery on-site at The Brazilian Court, a hotel just a block from the beach. The Paul Fisher Gallery is named for the longtime Palm Beach art curator, with works ranging from modern art to contemporary classic. Some of the hotels are actually works of art themselves. The Breakers Palm Beach was rebuilt in 1926, with the help of 73 artists brought in from Italy. They remodeled the building in the Italian Renaissance style, creating frescoed and artisan-gilded public spaces that start in the hotel's spacious lobby. Southwest Airlines this week launched Destination: Red Rocks, the first of its new "Destination" music series and its foray into destination art. The airline has selected six up-and-coming music artists and groups from cities around the country to compete for the chance to open for The Fray at Red Rocks Amphitheater in Morrison, Colorado next month. To compete, the artists will perform aboard select Southwest flights at 35,000 feet. The passengers, and those who later view the performances online, will pick the winning artist or group. "We've always been known for our warrior spirit and perseverance, which aligns us well with the emerging artist community," said Linda Rutherford, Southwest's vice president and chief communications officer. Art shows around the country also provide a chance to mix art and tourism. 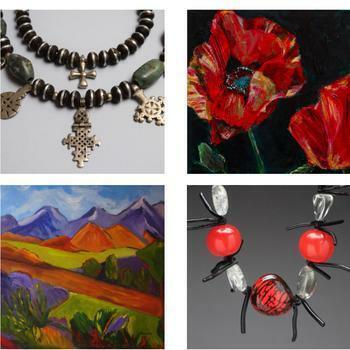 Santa Fe will host the 11th Annual Santa Fe Studio Tour the last two weekends in June. This year's tour features the work of 70 established and emerging artists, working in a wide range of media. 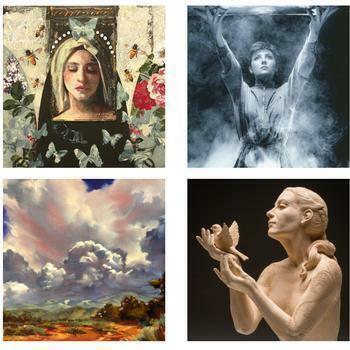 Santa Fe artist Erica Elliott says the annual show has become a destination event. "There are a lot of people who come from outside the area," Elliott told ConsumerAffairs. "I've had Hotel Santa Fe call me because a guest wanted to make an appointment to see the studio, and she was a travel writer from Sweden. We also get people from surrounding cities like Los Alamos, and Albequerque, people coming up for the tour." Elliott says the New Mexico city has become an art destination over the years because it has so many artists. It attracts both artists and art lovers. "When I moved here from San Francisco it was the light and the big skies that attracted me," she said. "And while my work has shifted from representational to more abstract, it is the landscape that is still my inspiration." The studio tour is free and self-guided. Visitors choose the open studios they want to visit and get to meet the artists, and in many cases watch demonstrations. It kicks off Friday, June 16 at 5:00 p.m. with an artists reception and preview gallery. You can find more information here. Santa Fe Municipal Airport is served by American Airlines, with daily non-stop service to and from Dallas/Ft. Worth and Pheonix. It's also served by United Airlines, with daily non-stop service to and from Denver.